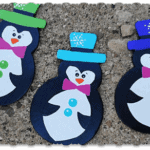 Paint each snowman cutout with 2 coats of White paint. Use Black to paint the penguin outline, creating a heart shape for the face and outlining the “belly”. Paint arms. Use Bright Magenta to paint on simple bow ties. Paint hats with Pool Blue, Apple Tart and Purple. Paint hat bands with Black. Use a brand new pencil eraser to dot on buttons using Pool Blue, Apple Tart and Purple to match their hats. Use the handle end of a paintbrush to dot on eyes with Black. Use a toothpick to add a small dot on the eyes with White. Do this for the buttons as well. Add a white snowflake to each hat. Use a toothpick to make one dot in the center, draw six lines out from the center like a flower then add a dot to the end of each line. Finally, add a dot in between each line. Add eyebrows with a black fine point marker. This project for Painted Wood Penguins was printed from CraftsbyAmanda.com - https://craftsbyamanda.com/painted-wood-penguins/ and can only be printed for education or personal use.